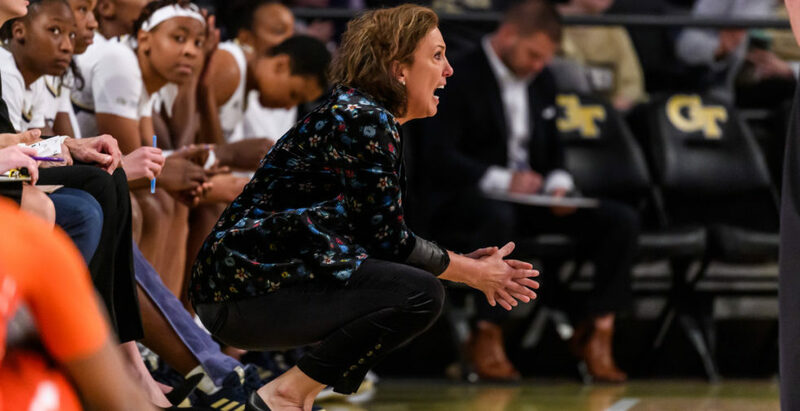 Almost a month after being placed on leave, Tech women’s basketball coach MaChelle Joseph was fired on Tuesday by the Georgia Tech Athletic Association (GTAA). The GTAA cited an investigation that found that “Coach Joseph regularly engaged in conduct that [student athletes and Tech employees] considered demeaning, belittling, and insulting.” Joseph had been on leave since February 27. On Tuesday night, Tech released the results of its report, conducted by an external investigator. The report cited the results of interviews conducted with all student athletes and staff under Joseph, former players, and other individuals associated with the team as well as Joseph herself. In response, Joseph’s lawyer gave a statement claiming that “the allegations in this report are false or completely taken out of context” and released Joseph’s official response to the report, written prior to Joseph’s firing. According to the report, many of the players reported a toxic and suffocating culture surrounding Joseph’s program, driven by Joseph’s culture and rhetoric. The external report noted that several players, when asked about their relationship with Joseph, reported feeling scared or mistrustful of her, and nine players on Tech’s thirteen-woman roster reported feeling unable to trust any member of the coaching staff. One player reported feeling anxious when simply smelling Joseph’s perfume, and another stated that she regretted coming to Tech as a result of how players are treated. Players also reported numerous physical symptoms that they attributed to stress caused by Joseph: “players indicated feelings of anxiety, depression, loss of appetite, and weight fluctuation” according to the report, and one player even reported that an eating disorder which she previously suffered from was made worse as a result of Joseph’s treatment. During the report’s interviews, multiple members of staff voiced concern that they believed Joseph engaged in “verbal bullying” and indicated that they had noticed players exhibiting symptoms of stress and anxiety. Multiple players claimed that Joseph would, on a given day, target a particular player for harsh scrutiny during practice or a game. Any mistakes by that player resulted in Joseph cursing them out in front of the team, resulting in players feeling extreme emotional stress. According to the report, one player indicated “her family expressed concern regarding her well-being, because they had never heard her cry that much.” The report noted that students reported being called several obscene, demeaning and profane names on occasion, including “b—-,” “p—-,” “cancer of the team,” and “w—-,” among others. Players indicated that this name-calling would occur with Joseph screaming in players’ faces, and many players characterized Joseph’s conduct as “verbal abuse” without a purpose in coaching players. Many players also claimed that Joseph would manipulate or ostracize players. A majority of players reported that Joseph would place the blame for losses on individual players after the game, even if that player was not necessarily wholly responsible for the loss. In another incident, prior to a team event off-campus, a player reported that she had been assigned to go to study hall instead at the last minute without her notice, and assistant coaches refused to give the player a ride. However, during a meeting, Joseph told other team members that the player had not wanted to attend the event, causing the player to feel ostracized by the rest of the team. Staff members corroborated many of these player complaints. Some players also reported suspicions that a team psychologist who also works for other Tech athletic programs, Dr. Belen Gutter, did not keep confidential conversations private and instead shared them with Joseph. Two players recounted specific incidents where wording that they had used in a privileged conversation with Gutter was repeated back to them by Joseph near-verbatim. While other players reported feeling that Gutter kept their information private, a staff member did recall a team meeting where Joseph reported having been told something about a player by Gutter, though it was unclear if the information had been shared by the player in confidence with Gutter. Several of the players and staff also felt concerned that Joseph pressured players to return from injury before they were ready, risking further injury and pain. According to the report, “employees with knowledge or experience regarding player injuries reported some concern that Joseph pressured medical staff to clear players to return to play,” though interviewed medical staff asserted that the final decision to clear players was always theirs. Still, multiple players reported Joseph pressuring them to return to action or claimed that Joseph would question if an injured or sick player was “faking it” during a game or practice. The investigators compiling the report did not cross-reference the allegations with medical records and concluded that there was insufficient evidence to confirm these claims. The report concluded that Joseph’s behavior “[fell] outside acceptable behavior under the [University System of Georgia] Ethics Policy” regarding harassment in the workplace, noting that the entire roster and multiple Tech employees believed that Joseph engaged in harassment, and that every student athlete either questioned whether Joseph should return to her position or unequivocally stated that Joseph should be relieved of her duties. Joseph detailed her reported history of complaints of inequity at Tech, and alleged that the Institute had subjected her to “ongoing retaliation and harassment” as a result of these complaints. Joseph further implied that as a part of this campaign, Tech had withheld the information that Joseph had been cleared of any NCAA Level I or Level II violations — the two most serious types of infractions — subjected two of her best players to drug tests, and resisted allowing women’s basketball sophomores to live off-campus, while the men’s players could. In response to the content of the report, Joseph went through each allegation of name calling and either denied that players had been called that name or claimed that the incident had been taken out of context. Joseph also provided several emails and texts between her, former players and players’ parents as proof that she had acted in a caring manner in previous instances.